Neptune Oyster gets ink. I read about them everywhere. I don't think it's as long as seven years, when they opened, but maybe it is. I read about them on Yelp and TripAdvisor, Zagat and Urbanspoon. There are exclamation points! Everyone is waiting on line for lobster rolls and oysters. Their PR bill must be enormous. They got their first award in 2006 for raw bar. 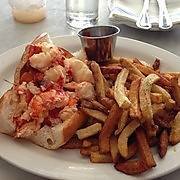 In 2008 it was clams, and in 2009 for lobster rolls. People agree the food is better than good. Most say it's small which, if everyone wasn't trying to get in, would be about the right size: 40 seats. Nearly everyone has something to say about no reservations. When I find a place we want to visit, it goes on the list. I keep lists on Post-its. I use neon colors that are three by six inches and come in sets of three. When I find packs that are "super sticky," I buy in bulk. The neon part is important when they get lost in your purse. They're impossible to miss so I cover them when servers come to the table. Once, a server bent over to read what I was writing. It did not make the food come faster. By the time we get to Neptune on a Monday, the hype has peaked. Some might even say it jumped the shark. All we know: it's raining and cold, the tourists are gone, and we don't plan on getting there until two o'clock. We will be fine. At two, there is a 30-minute wait. We put our names in and we know they call when they have a table because they did when we tried six months ago. (Then, we were impatient and went somewhere else, the place where the server read my neon notes.) Not today, today we will wait and we wait shopping. No handmade pasta, we go right for clothing. 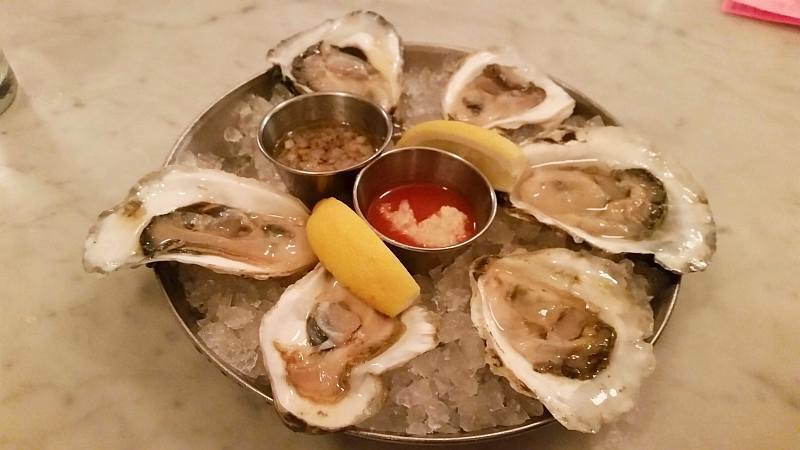 What happens when you order Island Creek oysters and you are not at Island Creek Oyster Bar? They don't taste like you remember. The oyster menu at Neptune describes them as high salt with a fruity finish and this is how I know them. Neptune's are briny, as promised, with a bitter finish. These must be Wellfleets. I ask the bartender who assures me, without checking anything, they are Creeks. 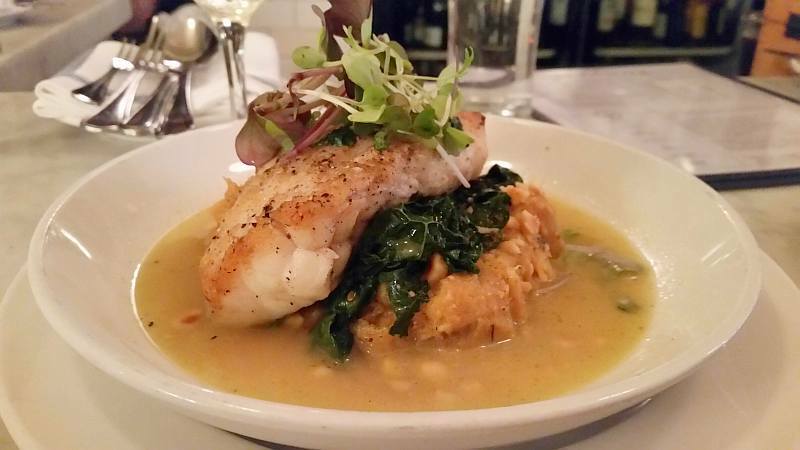 Roseanna orders Casco Bay monkfish that's served with squash, hazelnuts and kale (). She wants a buttery Chardonnay. The bartender has a secret stash not on the menu and pulls out a Napa Poseidon carneros (). This is okay, thank goodness. We look around. 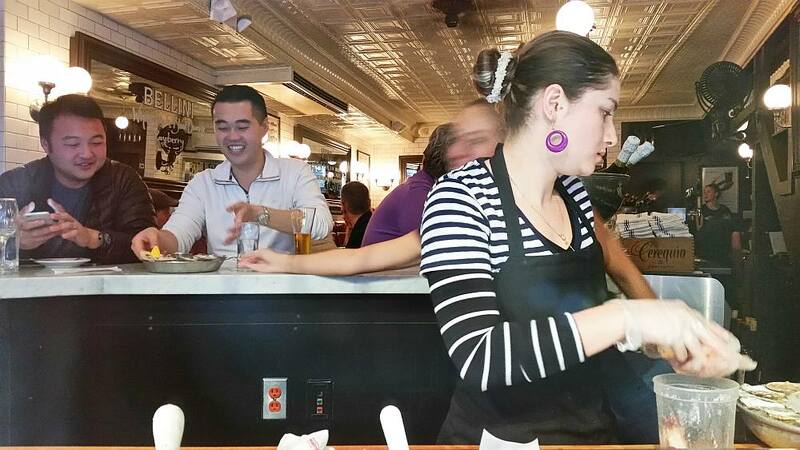 It reminds me of the Grand Central Oyster Bar with its subway tiles and fancy mirrors and I'm immediately homesick. (Even though it was the previous century, I know the Oyster Bar seats have backs. I check and they still do because there's no way my mother sat and twirled herself around.) I must see their menu. Oyster Bar's monkfish costs less and they do have Island Creeks today. Right away, I sign up for their newsletter. Everyone is having a lobster roll. It's comes hot on a roll with butter, or cold with mayo. Everyone also has fries; fries look not crisp but I can't say for sure. If you order something that comes with fries, you eat them because they are there, which is not a good reason but is in fact always the case. 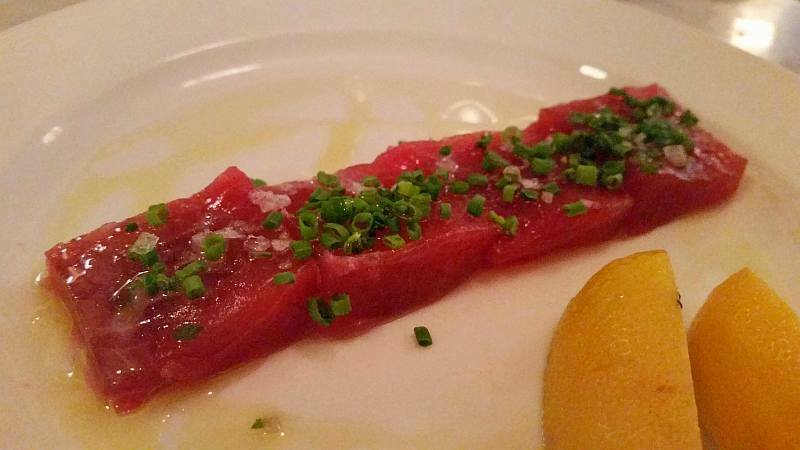 The crudo special is four small pieces of bluefin tuna in oil with chives and salt (). It's a lonely plate with as it turns out, super tuna. It's only my opinion but the last things tuna needs are oil or salt and it wouldn't be nearly as lonely with say, toasted French bread, and maybe a hat and gloves. It's all my fault for thinking six oysters and raw tuna could be lunch. A side salad? No, there are none. You can, however, order Spanish octopus salad for or lobster inverno at the market. Roseanna is good at sharing so I try the monkfish. It's tasty with a lobster-like texture complemented with fruity squash. By this time the room is less crowded so we can now take off our coats. Trying to make conversation, I ask the bartender if this is a regular day and he says it's a "weird slow day." It's not easy living up to hype. You can't throw a rock these days without hitting hype. The bill arrives: 0 for lunch and one of us is not that big an eater. It stops raining and we make our way over to Hanover Street where the air is filled with garlic enough to knock us over. Here is Modern Pastry. We both choose dark chocolate turtles. Sadly, some say service is "borderline rude - best case indifferent." Maybe it's more about how hard it is working in a crowded space. If you're in the North End and you don't mind waiting, we say go. 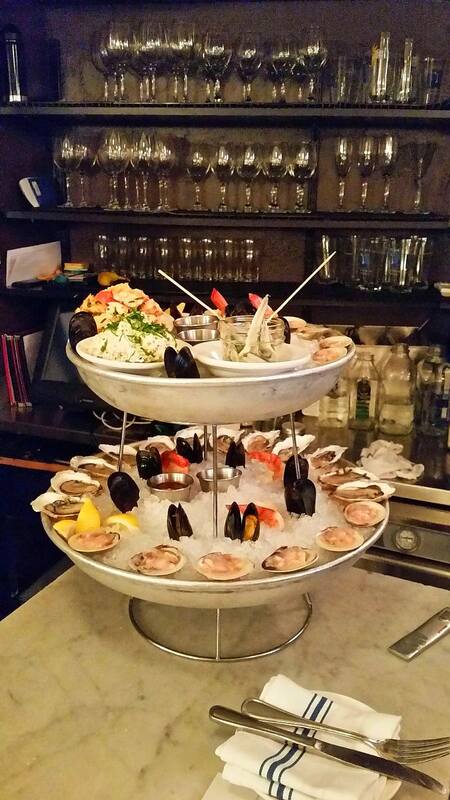 There are east and west coast oysters, clams, shrimp, crab and lobster cocktails. There's even a burger that comes with fried oysters. I think fried oysters would make a good appetizer. Sunday is for fish tacos and Thursday is shrimp and grits. It is, in its own way, a whale of a time; bring all your money.